Motorcycle-Superstore.com has joined forces with M1 PowerSports and Roland Sands to sponsor the 2012 Big Kahuna Nationals Triple Crown Trophies. The boards themselves are not only beautiful but are really good, shredable boards. It’s almost enough to make me pull the leathers out to try and win one. Motorcycle-Superstore.com is revving up its event sponsorship for the 2012 season. As a part of this effort, Motorcycle-Superstore.com is proud to announce its 2012 trophy sponsorship of the Big Kahuna Nationals Triple Crown series. The Big Kahuna is a three event series inside the AMA Pro Road Racing championship. Each of the three events will crown a “Big Kahuna” in every road racing class, and each Big Kahuna will be presented with a Motorcycle-Superstore.com sponsored full-sized trophy surfboard, designed by Roland Sands in conjunction with Motorcycle-Superstore.com and made by Hurley Surfboards. This year’s Big Kahuna Nationals will take place at Road Atlanta on April 20th-22nd, Homestead-Miami Speedway on September 21st-23rd, and in New Orleans at the NOLA Motorsports Park on October 5th-7th. 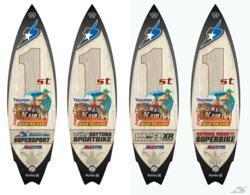 The Motorcycle-Superstore.com sponsored Roland Sands Designs Big Kahuna trophies are full-sized, surf-ready surfboards with motorcycle-themed graphics. The Big Kahuna Triple Crown has won “best trophy” awards in the past, and this year’s creation by Roland Sands, a former AMA Pro Road Racing Champion, will undoubtedly become a strong contender. The first of the three Big Kahuna Nationals events takes place at Road Atlanta, about 35 miles north of Atlanta, Georgia on the weekend of April 20th-22nd, 2012. Get your tickets ahead of time by calling (303) 377-3278 or visiting http://www.m1powersports.com. Motorcycle-Superstore.com is the leading online retailer in the motorcycle and powersports industry. Serving motorcycle riders for over 12 years, Motorcycle-Superstore.com specializes in selling motorcycle and powersports helmets, riding apparel, accessories and parts at the lowest prices possible. Internet Retailer magazine has ranked Motorcycle Superstore in the top 10 of all sporting goods sites and in the top 200 of all e-commerce sites. Powered by a dedicated staff of motorcycle enthusiasts, Motorcycle-Superstore.com continues to impress customers by constantly raising its online shopping standards. Visit http://www.motorcycle-superstore.com.